The presence of pharmaceuticals and personal care products (PPCPs) in natural water resources and drinking water supplies has raised public concern because of their potential adverse ecological effects on aquatic organism or even on human health. The study of pharmaceutical elimination is crucial in providing information for the disinfection strategy in water treatment facilities. This study investigated both the treatability and removal of eight pharmaceuticals (caffeine, acetaminophen, carbamazepine, sulfamethoxazole, trimethoprim, erythromycin, lincomycin, and codeine) as a function of treatment approaches, types of disinfections (free chlorine, ozone, monochloramine, and permanganate), and pHs, by using liquid chromatography – tandem mass spectrometry (LC-MS/MS). Both deionized (DI) water and natural water were spiked with 5 to 20 µg/L of pharmaceuticals and dosed by commonly used oxidants at a typical concentration followed by analysis using LC-MS/MS. It was found that the degradation levels of the pharmaceutical compounds varied significantly in different oxidation processes. 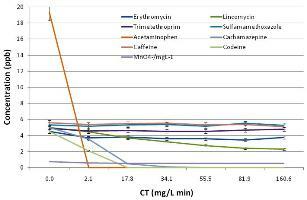 Chlorination at 1 mg/L was highly effective in removal of some pharmaceuticals. Monochloramine at a dose of 3 mg/L was mostly ineffective to all the pharmaceuticals tested. The pH conditions also played an important role in PPCP removal, and its effect was conditional based on the oxidation systems and pharmaceuticals involved. Finally, powdered activated carbon (PAC) was also evaluated for its effectiveness in the removal of the pharmaceuticals in drinking water treatment.